When the St. Louis Language Immersion School (SLLIS) began seeking a new home, it landed upon the massive factory at Tower Grove and Vandeventer avenues currently occupied by Suburban Industrial Packaging. The stately Classical Revival office block bookends what essentially is a concrete, fireproof manufacturing machine built by St. Louis’ once-largest printing company. With its ample daylight, the building will make for a humane school to rival St. Louis’ early 20th century daylight masterpieces by William Ittner, despite being built as a site of toil and production. SLLIS turned to UIC and PRO for professional services. PRO Architectural Historian Lindsey Derrington was the energetic primary author on a National Register of Historic Places nomination approved at the state level in May 2014; PRO Director Michael R. Allen prepared revisions after Derrington relocated to Texas. Designed by the prominent St. Louis firm Klipstein & Rathmann, The Woodward & Tiernan Printing Company stands at 1519 Tower Grove Avenue in the Forest Park Southeast neighborhood of St. Louis. The factory architects recruited internationally prominent industrial engineer Wallace Clark to develop a very significant local instance of straight-line assembly planning in a daylight factory. The flat-slab reinforced concrete factory is an excellent example of early 20th century industrial architecture which combines the technological advances of daylight factory design with the planning tenets of rationalized industrial engineering. Woodward & Tiernan, established in 1865 and the city’s leading commercial printing firm, commissioned the building in the early 1920s to accommodate its growing business of providing fully-integrated branding campaigns for major industrial clients nationwide. Designed around straight-line production workflows on adaptable open floor plates, the building embodies industrial engineering’s ideal of the factory as the “master machine,” quantified and analyzed to eliminate waste and increase production. 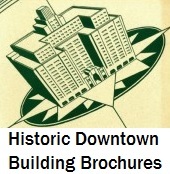 The period of significance is 1926, the date of the building’s completion. Image included in article, “Woodward Tiernan Printing Co. to Build New Plant on Tower Grove Avenue at Cost of $1,000,000” (St. Louis Post-Dispatch, 26 June 1921). The Woodward & Tiernan Printing Company Building remains an excellent example of early 20th century industrial architecture, fusing industrial engineering and architecture at a time when modern, scientific factory design defined American architecture in its golden age of industrialism. Today, the building’s open floor plans testify to a successful design based around straight line production, and the scale and size of the building reflect the architectural expression of the company’s need to modernize. 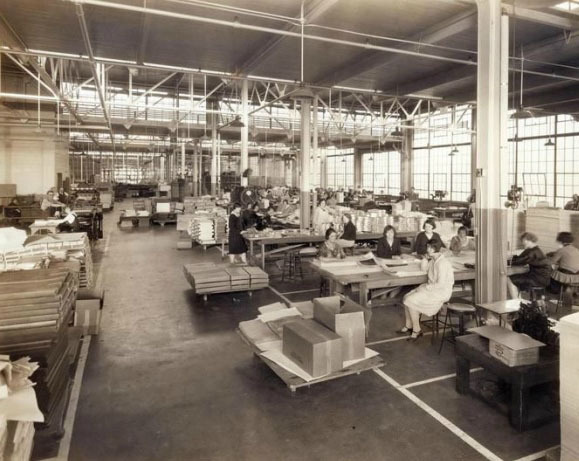 The second floor finishing department at the Woodward & Tiernan plant in 1927. Source: Missouri History Museum Library and Collection Center. The factory building retains elements that defined it as a modern daylight factory: lighting from large windows and roof lighting, regular column spacing and avoidance of permanent partitions. When company president L.B. 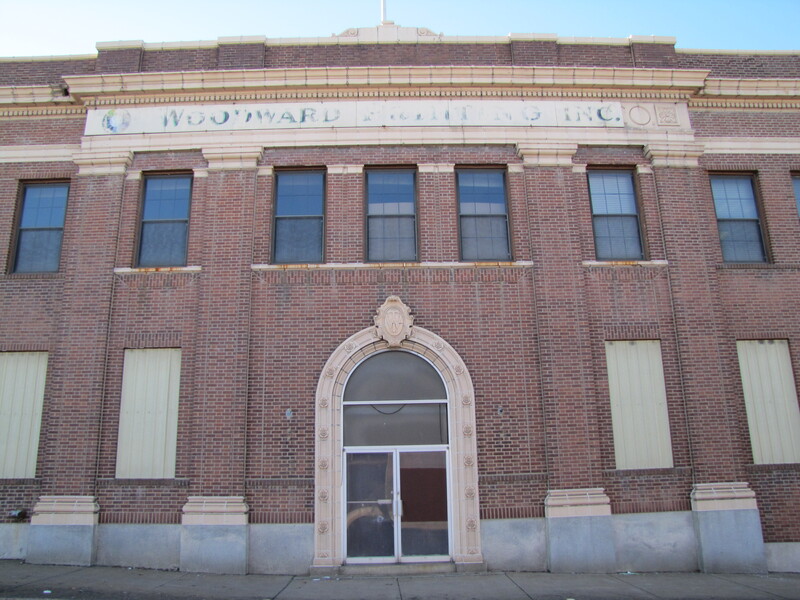 Woodward deemed the new factory “an ultimate economy” in 1927, is statement referred to the qualities that make the building exemplify an industrial building type that advanced the production of his and many other companies nationwide.